This is a new manufactured battery, not a refurbish of an old battery. All our batteries are built in the US by Amco Intl. Manufacturing using the highest quality components and cells. 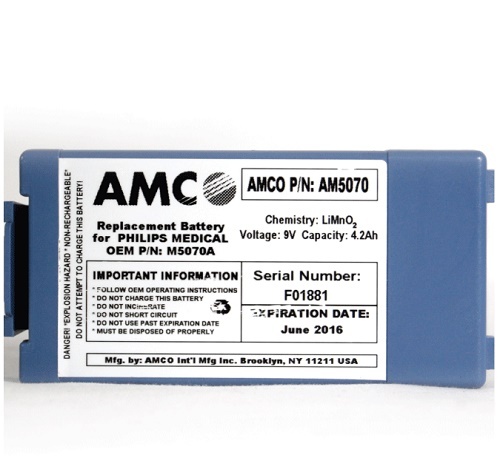 FDA 510(K) Approved Replacement Philips M5070A Battery By AMCO is used in the HeartStart OnSite and FRx AEDs. The MD-AM5070 replaces Philips HeartStart OnSite M5066A and HeartStart FRx 861304. The MD-AM5070 is designed for 4 hours of operating time or 200 shocks (whichever comes first) in the AED and has a 4 year shelf life. The maximum warranty is 4 years (shelf life) or 4 hours operating time or 200 shocks, whichever comes first. Proper Maintenance: Do not attempt to recharge. Do not use beyond the expiration date marked on the label. Do not expose to temperatures greater than 50 degrees Celsius (122 F). Do not allow electrical connection between the contacts, as it can blow the internal fuse and disable the battery permanently. Ground Transport Only: Cannot be shipped by air (Priority Overnight, Standard Overnight, 2nd Day, 3rd Day, International) due to federal regulations regarding the transport of primary lithium cells on aircraft.